Mendeley is a reference management package that helps you build libraries of references and then add citations and bibliographies to word processed documents. This session will be run in two parts with a break in between. If you are an advanced user of Mendeley you need only attend the second part, starting at 15.25. The University provides a set of study skills guides. These include information about plagiarism and referencing. Study guides covering referencing, plagiarism, revision and time management skills. 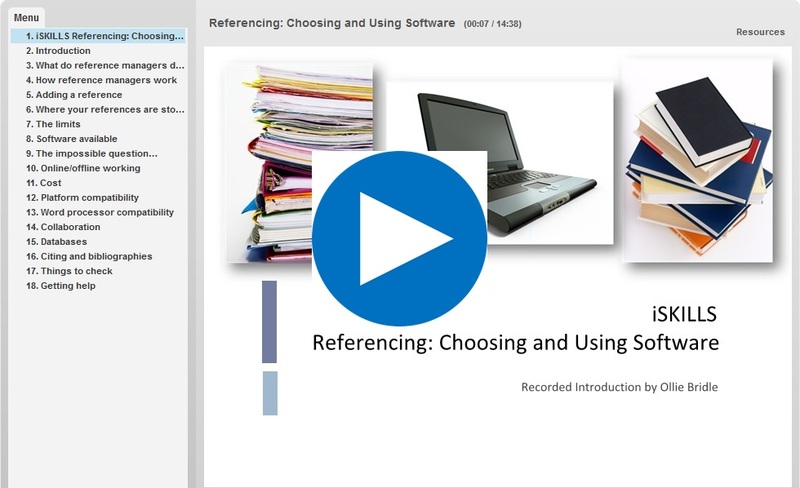 What is reference management software? Our Bodleian iSkills workshop Referencing: choosing and using software introduces the main features of reference management tools and considers the issues to think about when choosing software. View the introductory presentation from the workshop below and book a place at our next workshop to try out four different software tools for yourself. For a comparison of the pros and cons and of the features of some of the most common reference managers, see the comparison table. For more detailed information about these reference managers, including sources of help and training, refer to their individual tabs at the top of this page. Is the citation/reference style you need to use available? Is the software compatible with the word processor you use? If you want to share your references with colleagues, what do they use? You can now import references from SOLO into virtually any reference manager. SOLO offers dedicated export options for RefWorks and EndNote online, but can now also export an RIS formatted text file which is compatible with many different reference managers. 1. Locate the full record in SOLO for the item you wish to export. 2. Under 'Export options' select the export option you wish to use (RefWorks, EndNote or RIS).